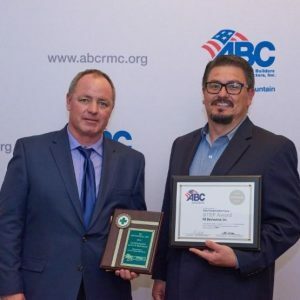 June 1, 2018 – The Associated Builders and Contractors Rocky Mountain Chapter (ABCRMC) hosted a Safety Conference & Awards Luncheon last week to educate members and recognize those who have demonstrated an outstanding commitment to safety. The event celebrated collective efforts towards safety and education in the construction industry. RK received an award for Outstanding Safety Programs – Subcontractors, Over 1 million man-hours along with a Platinum Level STEP award. RK’s Director of Safety, Tom Alvarez, and Safety Manager, Rick Daulton, attended the luncheon and accepted the awards on behalf of RK.